So like you’ve probably already guessed, I don’t celebrate Valentine’s Day. I’m still the same pessimistic holiday-hating old ninny, dreaming of waving my cane at the kids (“get off my lawn!”) and cuddling my 43 cat roomates while worrying whether or not my 112 aseptic packages of tofu are enough to get me through the next two weeks. I just like a challenge, especially one that involves putting words on stuff. That and the fact that these will be left out for my partner to find while I’m mid-flight over the Atlantic is going to have me pooping myself in tears of laughter for all 8 hours of my time in the air. (Happy Valentine’s Day, captain). Don’t ask. 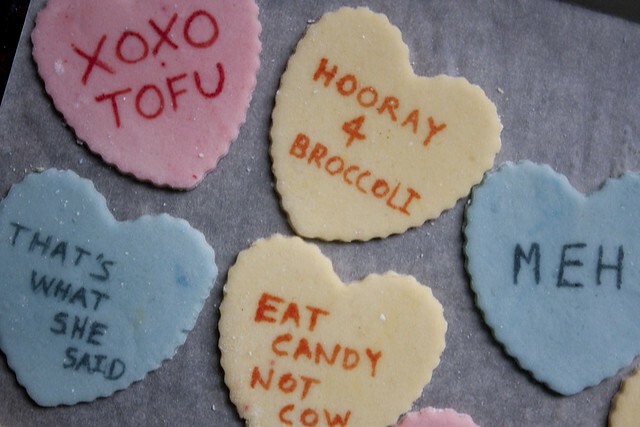 Vegetarians and vegans know Valentine’s Day love just doesn’t extend to those in need of confectionery memos to communicate their true feelings. 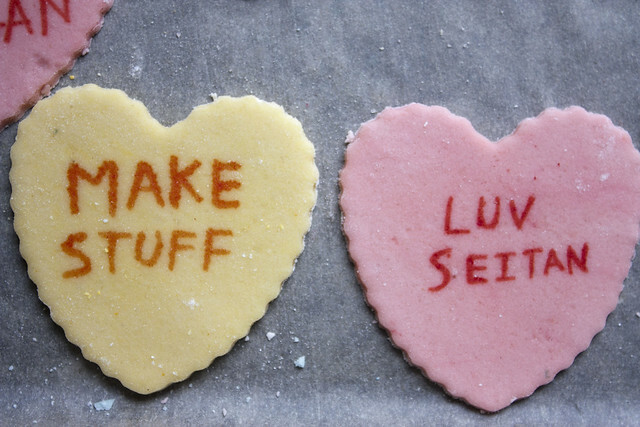 Sweethearts infamously contain gelatin, the veggie candy connoisseur’s loathsome adversary, leaving us no textual candy come February. In case you haven’t heard of conversation hearts, they’re small heart shaped candies sold in the U.S. around this time every year. They’re imprinted with quirky messages from sappy (“UR mine”, “luv you”) to absurd (“whiz kid”) and disinterested (“go home”), and they get updated over time (wondering if “fax me” is still in the lexicon). It’s been more than ten years since I’ve seen one, so I’m probably beyond out of date. The recipe I used was this one, only instead of gelatin I used agar, and instead of corn syrup I used liquid glucose. The act of heating the agar and water to mix evaporated some liquid, so I threw in a splash of soy milk to make up for it. Blue is bubble gum (I used a monin syrup to flavour these suckers), pink is vanilla, and yellow (coloured with turmeric) is lemon. The shapes are also a lot bigger (did you really think I’d go out in search of a tiny heart shaped cutter), but thinner so not too sickly. The writing? Yes, I did it with toothpicks. Classy (err) and neat (not), but effective (partially). The theme? Veggie, dejected, your mom, and attitude. What did you expect? omg. love! please tell me one said “your mom”?! oh yes, there were some rather inappropriate ones. I’ll send you a pic! You are amazeballz, as always.